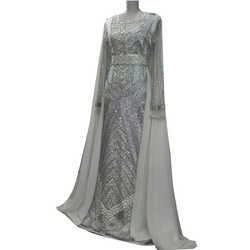 Offering you a complete choice of products which include hand embroideries western dress and western embroidery dress. Hand Embroideries Western Dress Black Color designer Rasal fabric Hand beaded Dress. Black and Gold Color Designer Embroideries Western Dress Long Sleeve Wedding Caftan. Looking for Hand Embroideries on Western Dresses ?